With the experience of developing over 100 mobile apps for education industry, we design, develop, test and launch customized mobile applications for schools. Our developed school management apps keep parents informed about their child’s performance and help students to stay connected with teachers. We develop a complete mobile app solution for all the schools that help both parents and students to connect with teachers, get instant access to assessment notification, sports updates, events, news, newsletter, school travel information and more. We have developed more than 100 school mobile apps for different schools which helps school administrators, parents, teachers and students communicate via real-time messaging.Here are some of the top features of school communication apps that we have already developed. Mehbaz school app gives school to keep up every students profile. It is an instant communication tool for parents and teachers. Teachers can make worksheet according to the school's educational modules and offer it with parents and students. In addition, parents can likewise check the report card of their child and convey about it with their class teachers. Mehbaz school app has options to know teacher’s remarks about the student’s attitude and his enthusiasm towards studies. 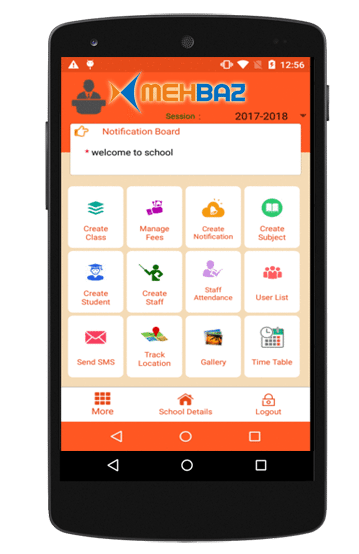 Mehbaz school app flexible to get time update of school circular information. A complete staff registries with one-contact calling, enabling parents to call any staff whenever and anyplace with a single click on the application. This feature will help school authorities to informing all the parents and students about upcoming exams, announcements, events, monthly newsletter and any other important news. Parents will get important updates and notifications about upcoming exam schedule, courses, events, and syllabus, and an important announcement. Real-time updates will be sent to all the parents and students. Using Mehbaz school app parents can know the school fee details and exam fee structures in timely manner. Parents can follow the progress of their child with point by point investigation and know where he/she needs to make strides. In addition, parents check the advancement as the year progressed by-year chart that encourages them to watch out for their child.